Here you will find detailed information about a wide range of products and services available to you online or in our store located at Southgate Plaza Shopping Centre, Sherriffs Road, Reynella. With our friendly personal service you'll appreciate all we have to offer as your local Newsagency, and SA Lotteries Agency. Whether you are visiting our store or visiting us online, our staff are always pleased to offer assistance. Just ask our friendly staff in store, or here online just click contact us. As well as lots of information about the products and services offered through our newsagency, you'll also find some special stationery offers in our online store. You may also search for your favourite magazine, find all your metroticket and public transport information and much, much more . . .
As well as your favourite SA Lotteries games and Instant Scratchies we have a great range of house syndicates available. Weekly house syndicates are a popular way to play your favourite SA Lotteries games. We have a variety of weekly syndicates available for you to join whether you are looking for a single syndicate share or to become a regular member. 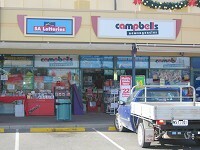 As your local Newsagency and SA Lotteries Agency we are very much part of your local community. So if you need some information on the local weather, it's right here for you. You may not need our location map to find us, but it has some other interesting features for you to explore. When you need to contact us and cant make it to the store, then visit the contact us page to find a way to contact us that is convenient for you.